The Lok-Itt Column Lock™ secures most domestic and foreign automobiles, light trucks and SUVs from vehicle theft. This anti-theft device is recognized by law enforcement, insurance firms, auto clubs and consumer groups as a leading stand-alone solution to auto theft. Both the design and heavy-duty steel construction make the Column Lock™ virtually impossible to defeat. Highly visible markings and distinctive coatings on permanent and removable models provide twenty-four hour security for your vehicle. Learn more about how the Column Lock™ deters potential thieves and protects your vehicle. Copyright © 2002-2008 The Lok-Itt Company, Inc. 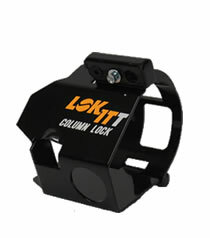 The Lok-Itt Column Lock™ is a Trademark of The Lok-Itt Company, Inc.